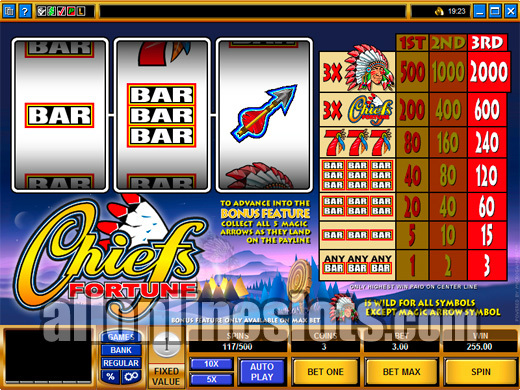 Chief's Fortune was one of the first bonus slots to be released by Microgaming. It uses the three reel, single line format and has a jackpot of 3,000 on the base game. 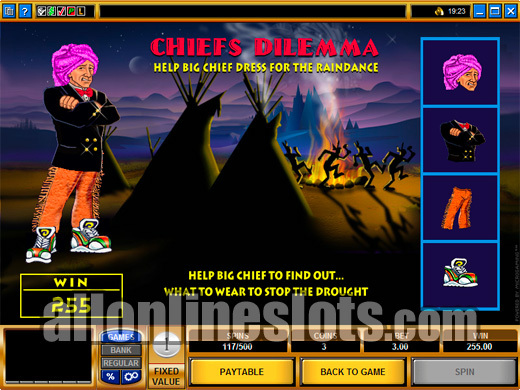 Collect arrows to get a shot at the Dress the Chief bonus feature. Chief's Fortune matches the excitement of a three reel, single line slot machine with an additional way to win - a second screen bonus feature. It has a fixed $1 coin size and requires a max bet of $3 per spin to qualify for the bonus game. It has a total of seven winning combinations all of which are three symbol combos. There are no single symbol wins such as cherries. The top jackpot is $2,000 for hitting three wild chief symbols on the pay line. Second highest pay is for lining up three Chiefs Fortune logos which pays $600. There is an arrow symbol which only appears on reel three and a target located below the reels on the right. Every time you hit the arrow on the pay line on the third reel an arrow is added to the target. Collect five arrows and you are win a shot at the second screen game. A couple of important notes. Firstly you must be playing the maximum bet of $3 per spin or the arrows do not count towards the bonus. Secondly you do not have to get all of the arrows in one gambling session. They are saved for you on exiting the game and will be there when you come back to play later. The bonus game is slightly odd. You get to "Dress the Chief" by picking items of clothing (View Second Screen). Each item offers a bonus award. When the Chief is fully dressed you get a bonus total added to your credits and the game ends. While we are not entirely sure that the Chief would be pleased to see what we can dress him in he does give some nice pays. 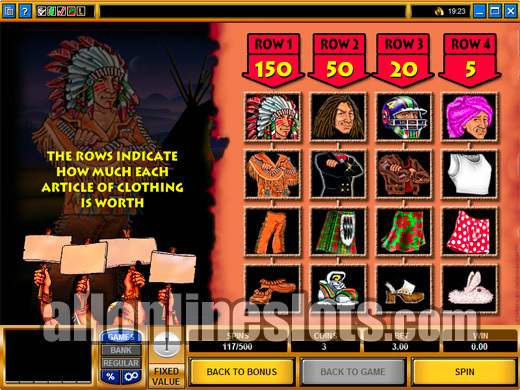 Overall, Chief's Fortune is a good example of how a bonus feature can add to the excitement of a classic style slot machine.